Casa Vieja Lodge hosted the prestigious Marlin University of Marlin Magazine from April 23-28th. Marlin University gives anglers hand-on, personalized, side-by-side instruction in actual blue-water conditions! Joining us in Guatemala were top billfish instructors Dave Ferrell, Fly Navarro, George Sawley, and Bo Jenyns. A MU instructor is on each boat which gives the anglers the coaching needed to help land billfish. Every evening MU instructors deliver a comprehensive course on all aspects of preparing for, finding and landing the big ones. Out on the water daily, anglers rotated boats to experience new crews and instructors, and were given hands-on advice and coaching to help them become better anglers! Marlin University totals were 468 sailfish raises, 414 bites, and 204 releases, with 4 marlin raises, 4 bites, and 3 releases. An excellent training ground to put your education to the test! A local fishing club in Miami called, The Tropical Anglers, took their maiden voyage to Casa Vieja Lodge with 12 anglers all looking for a first of some kind. 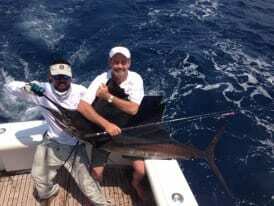 Some anglers enjoyed their first pacific sailfish, which dominates that of the atlantic sailfish size, their norm. Others released their first sailfish on fly, a blue marlin, and other carnivores simply worked in the schools of mahi mahi and tuna. “Casa Vieja lived up to it’s reputation and many memories were made. For anyone even contemplating a trip to a foreign destination, this is a bucket list trip. On Trip Advisor you can only give them 5 stars but if there was a higher number, they’d get it because they really know how to treat you.” said Rob Hammer, group leader and honorary cat herder. Thank you Tropical Anglers for allowing Casa Vieja to be your first! The graduates of Marlin University welcomed the man in the blue suit, Mr. Marlin, into Guatemala. Over the past 2 weeks, the fleet has been consistently raising blue marlin that are chasing giant mahi mahi left and right. The 35’ ST Contender, El Cadejo, released 4 blue marlin this past Sunday, May 6th. Casa Vieja always recommends May and June as some of favorite months as the seas slick out to a lake, and the variety of species jumps into action besides the ever-present sailfish. Many believe that the winter months are the most popular but that is due to the tourist season, not the species season. Guatemala is extremely unique compared to other central American destinations. Head off shore, towards the fishing grounds, and you run into the Guatemalan “pocket” that makes for just about perfect conditions for our billfish. One can only describe this natural phenomenon to deliver the best temperatures, oxygen levels, with eddy formations that concentrate baitfish at the surface, all contributing to billfish catch. Casa Vieja Lodge would like to wish all the mother’s out there a very happy and healthy Mother’s Day. If you can’t celebrate in Guatemala, we hope get out on the water and enjoy your day. If you are still looking for gift ideas for that special mama in your life look no further than some new shades from Costa del Mar. 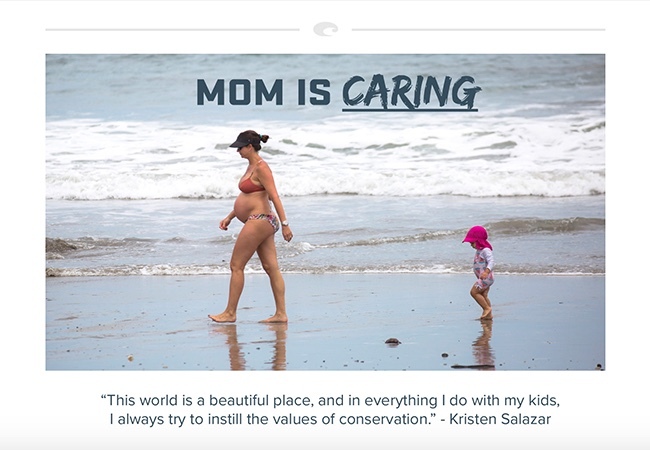 Mama, Kristen Salazar, loves the new style Sarasota, click here for more info. Mom’s normally have everything in their bag. So get her one that’s durable, and stylish for the outdoors. Our top choice is the YETI Camino Carryall Tote. Totes cool! After the Cinco de Mayo festivities the sailfish have been muy caliente! We have been seeing double-digit raises and releases constantly! Mahi-mahi, tuna, and marlin have been in the daily spread as well. 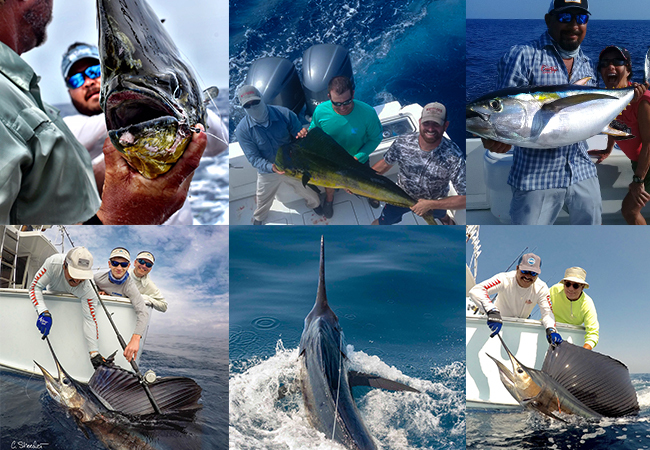 May-June is a great time to come to the lodge if you are looking to catch a variety of fish in the calmest of seas! April 19-21st , the Intensity (37′ Gamefisherman) with Capt. Mike Sheeder, had 58 raises, 37 bites, 27 sailfish releases, and 20 tuna! April 19-May 9th, fishing 10 days, the Poco Loco (44′ Kincheloe Nickerson) with Capt. David Salazar, had 208 raises, 182 bites, and 86 sailfish releases. They also had 3 marlin raises, 3 marlin bites, 1 marlin release, 3 tuna, and 17 mahi-mahi. 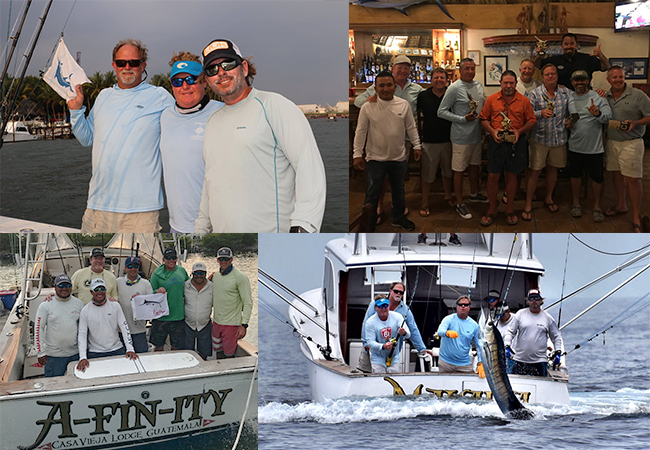 April 20-22nd, the Afinity (39’ Billy Knowles) with Capt. Nico Melendrez, had 59 raises, 25 bites, and 16 sailfish releases. They also had 2 marlin raises, 2 marlin bites, 2 marlin releases, and 9 tuna! April 20-May 5th, the Makaira (37’ Rybovich) with Capt. Jason Brice, had 194 raises, 152 bites, and 76 sailfish releases. They also had 4 marlin raises, 4 marlin bites, 3 marlin releases (1 striped marlin), 14 tuna, and 19 mahi-mahi. April 20-May 9th, the Finest Kind (40’ Whiticar) with Capt. 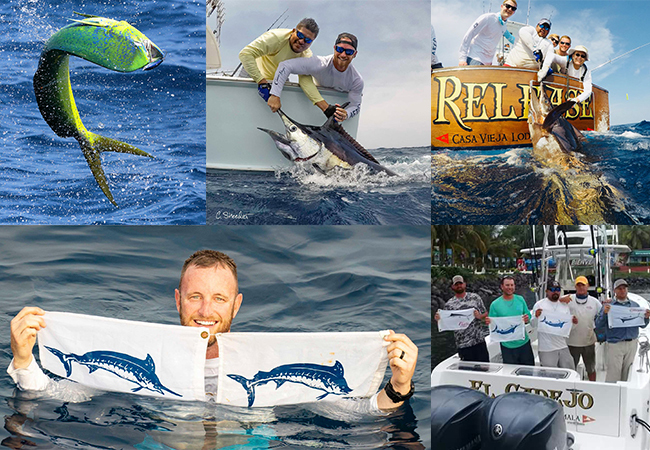 Chris Sheeder, had 435 raises, 338 bites, and 167 sailfish releases. They also had 19 marlin raises, 11 marlin bites, 4 marlin releases, 8 tuna, and 41 mahi-mahi! May 1-9th the El Cadejo (35′ Contender) with Capt. Efron Rizzo, had 108 raises, 79 bites, and 53 sailfish releases. They also had 18 marlin raises, 13 marlin bites, 5 marlin releases, 23 tuna, and 46 mahi-mahi! May 4-9th, the Release (37′ Merritt) with Capt. Chico Alvarenga, had 123 raises, 97 bites, and 64 sailfish releases. They also had 4 marlin raises, 3 marlin bites, 1 black marlin release, 17 tuna, and 27 mahi-mahi. May 5-9th, the Pez Raton (35′ Contender) with Capt. Franz Hoffman, had 68 raises, 54 bites, and 25 sailfish releases. They also had 4 marlin raises, 4 marlin bites, 1 marlin release, 47 mahi-mahi, AND 1 roosterfish!